Four years in the making and hours of thought, planning and fundraising from ETWA volunteers, friends and supporters has seen the completion of the first of our women’s centres in the remote village of Fuat in Iliomar. 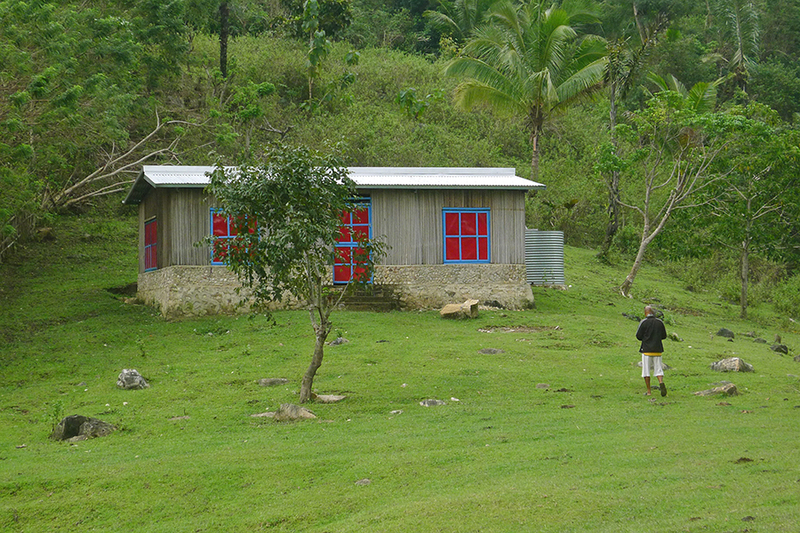 May 2012 This has to be one of the prettiest simple buildings in rural East Timor! The red and blue gingerbread windows cast a warm light inside the building and create an eye catching appeal outside. But let’s not concentrate only on the aesthetics! 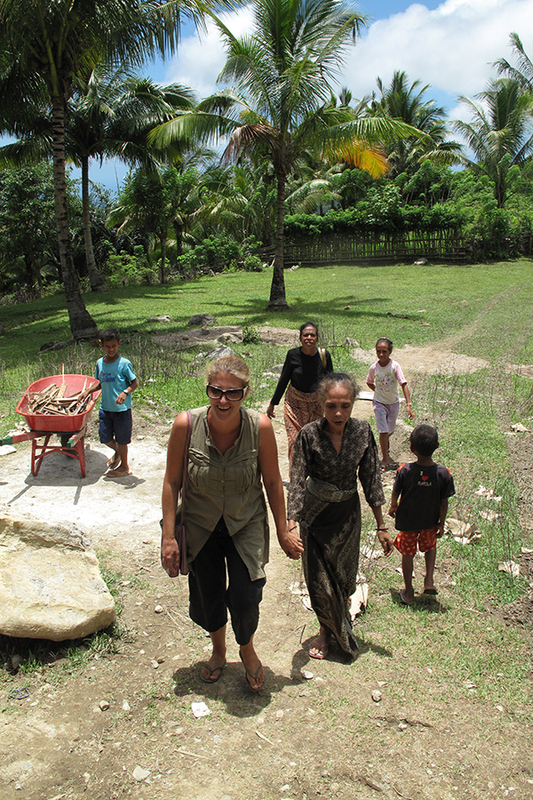 The building has taken years to complete as volunteers in East Timor and Australia made time to see it come together bit-by-bit over four years. 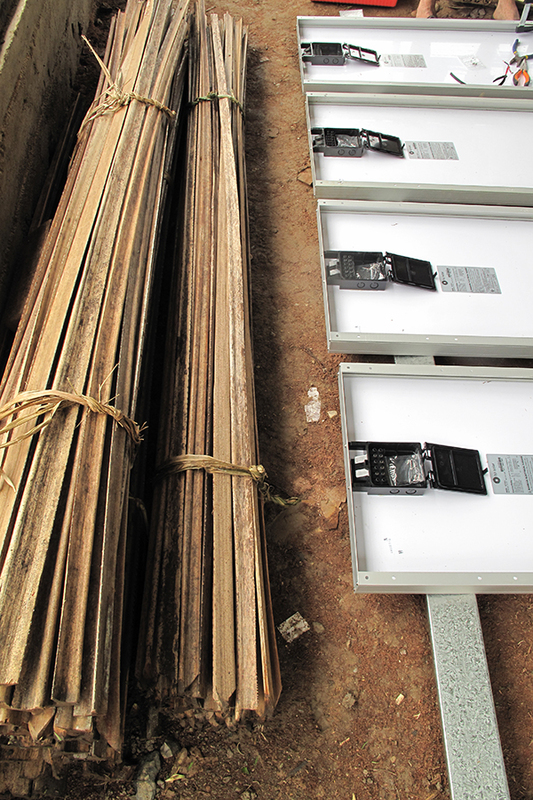 The weather played a major factor too as many of the processes require sunlight and heat. 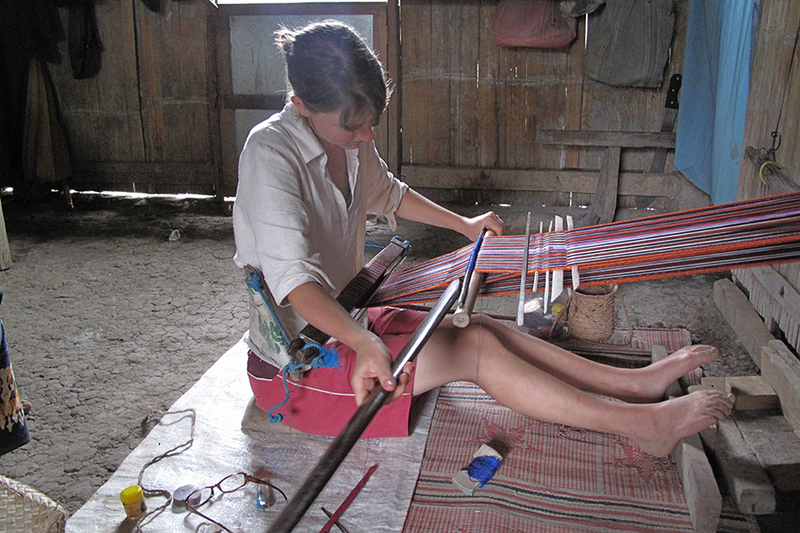 The good news is that the whole community utilise the space for weaving, training, study and meetings of course. Thanks to everyone who helped make this dream become reality. To the exceptional support provided by Rotary and East Timor Roofing, the ATA, the Victorian Women’s Trust, the building team and our many, many volunteers, particularly Darren, Graeme, Darrylin, Sally and Iona and the ATA team, Rowan and Peter, thank you from the heart of Fuat. You’ve helped build more than a building! This page is dedicated to the joyous man on the right- Maun Mari - without his hard work the Fuat Weaving Centre would still be a dream! The building was truly a collaborative effort. 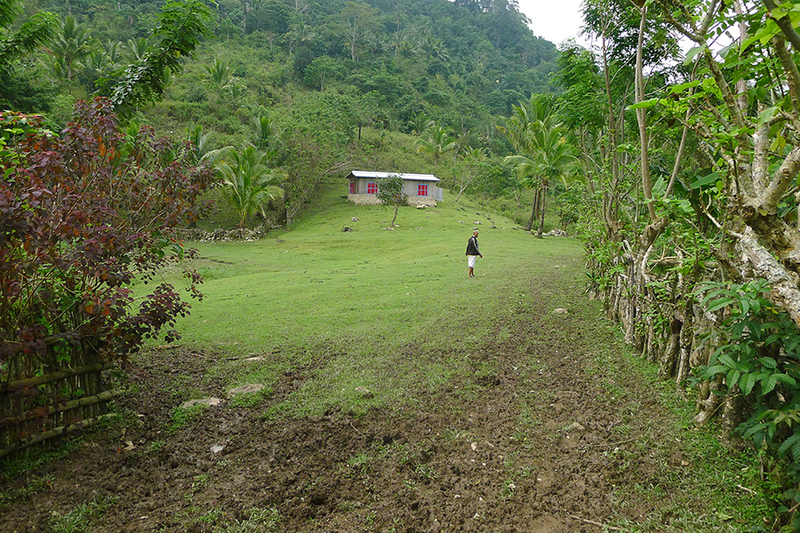 The Chefe de Suco (Village Chief) gifted a beautiful, large piece of land on a slightly sloping hillside behind the picturesque village of Fuat to the Materestu weaving group. From the south there are big views to the ocean and north, to dense forest and mountains. In early August, a meeting was held with village leaders to publicly state the objectives of the building and emphasize the motive behind land allocation. This process aims for collective knowledge and transparency should there be uncertainty in the future. 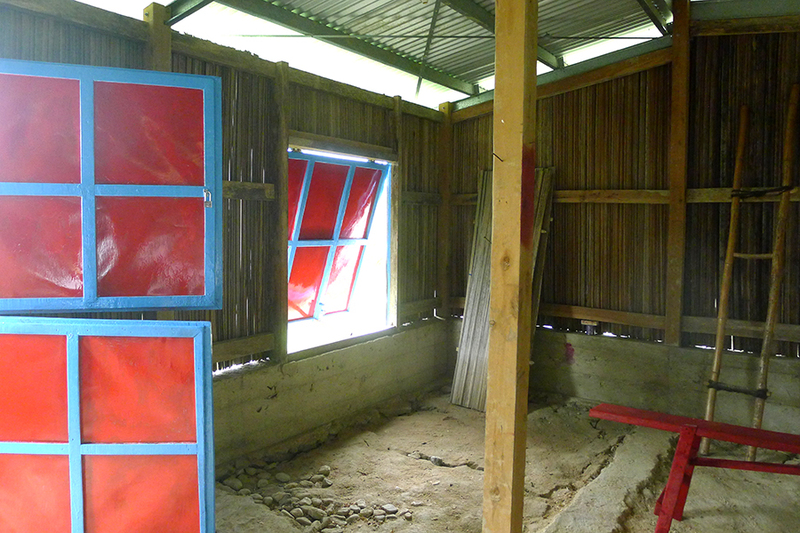 Tim Stats, a volunteer architect working with the Red Cross, visited the site in July and transformed the original simple L-shaped design, which was selected by the community, to include the use of local stonework, familiar to the builders in the village (Iliomar means stone house). The design incorporated three traditional houses aimed at providing accommodation for tourists and visitors, with the larger building being the main work space. This design complimented the landscape and village and was used as the basis for the main building as it now stands. 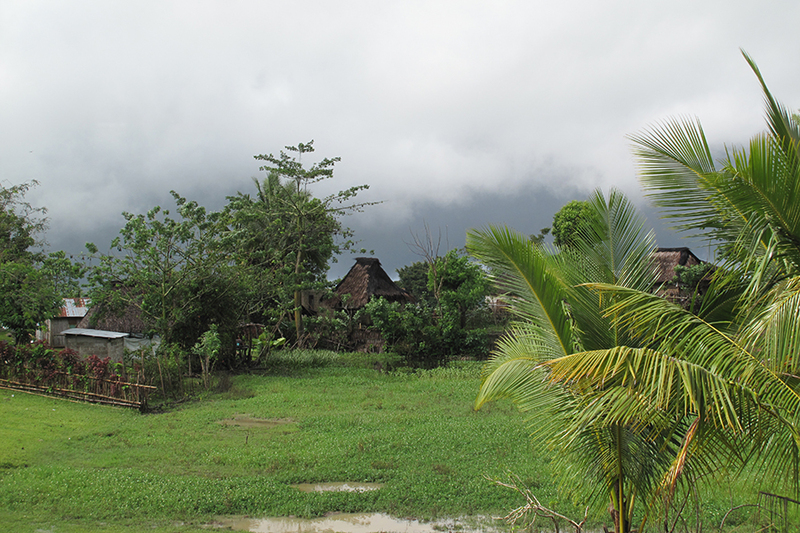 Throughout July-October, which is usually the dry season, Timor experienced heavier than usual rains so construction was almost postponed to the next dry season in 2011. However as the men in the village were motivated, organized and willing to work in difficult conditions, we didn’t have the heart to reschedule. The two Aussies builders and other ETWA volunteers had also booked their flights and organised time off work so we decided that come rain or shine, nothing was going to stop this project going ahead- and nothing did! The cooperation and commitment throughout the whole process was remarkable. 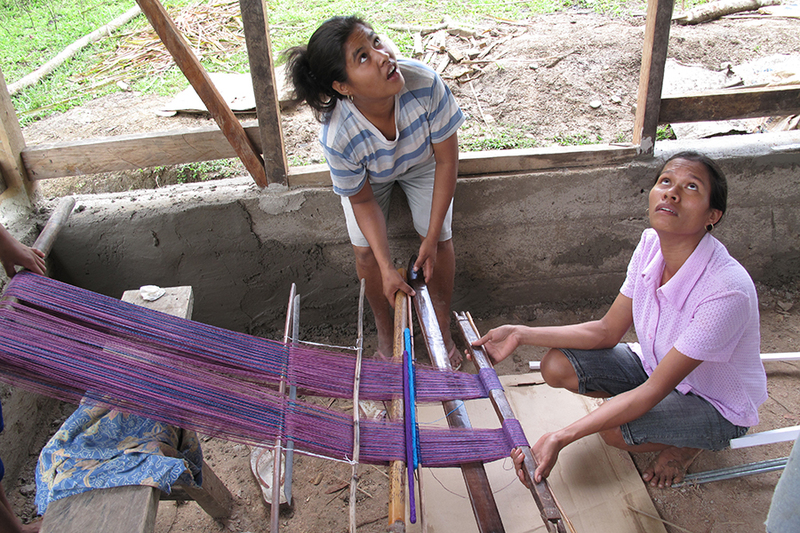 There are thirty-six weavers in the Materestu (Survivors) weaving group (including six widows) and twenty-four capable husbands volunteered to help. The men organised themselves into four groups of six, with the aim of working on rotation to enable them to keep up with their other subsistence work. They were adamant that as the building was for their community, they would work without payment. They took full ownership and responsibility over the process. This sets the bar high for the other centres we’re planning to build for the two remaining weaving groups. The first foundation stones were laid in late September after a traditional ceremony to bless the land. My friends had selected a large white stone from the beach in Lautem to symbolise that ETWA comes from across the ocean. The rains had reduced the 2km road into the village to sludge so my old Toyota 4WD ute was used to carry ten loads of sand from a local river, two hours by car one-way. Sixty-two sacks of cement and sixty-six lengths of local timber were purchased in Los Palos, delivered in heavy rains to the village entrance and carried by the men to the site. They also manually collected and carried more than nine cubic meters of small and large stones from the surrounding forest for the foundations. The foundation trenches had been prepared by the community in late September based on the old design but the building was obviously too small to accommodate even minimum activity. 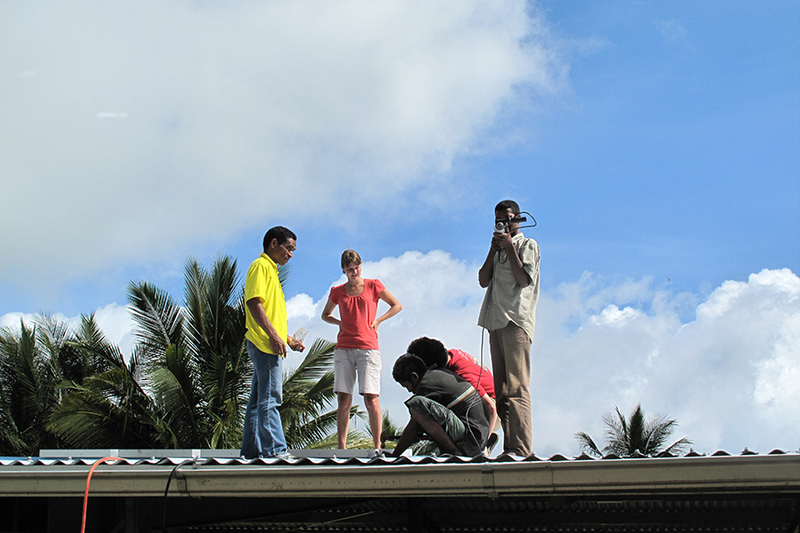 As the order for the roof had already been placed with East Timor Roofing, it was requested that ETWA provide extra funding to expand the building at the front by 2 metres with an enclosed verandah. The first Australian builder, Darren David, along with two ETWA volunteers, photographer Sally David and budding architect Iona Dierich, arrived in October 5th and we took delivery of the roofing materials in Los Palos on Oct 6th. 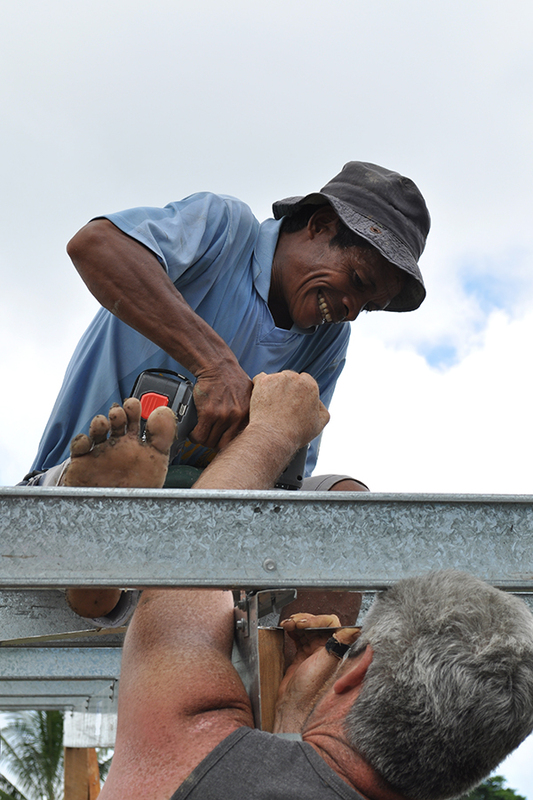 When the East Timor Roofing truck arrived, we were pleasantly surprised that the larger tank on the truck was for the weavers! Before heading up to Iliomar, Darren adjusted the plans, extending the floor space even further, while keeping as close as possible to the original design. The new building was marked out on the 7th Oct. It was astonishing to see the men use a small hose filled with water to determine the level of the foundations and small branches and nails and a simple string line to determine right angles. The space was much larger and more appropriate to the needs of the group, with a small office and store room. Eighteen villagers worked tirelessly and quickly to dig deep trenches and remove massive rocks. To our surprise, the foundation stone work was completed in just a few days. The other Aussie builder Graeme Gibbons and his wife Darrylin arrived in Iliomar on the 12th Oct. As the community had no experience working with the steel beams and battens for the roof provided by Rotary, Darren and Graeme’s main objective was to get the roof completed before they returned to Australia. Power tools had been collected by ETWA members in Australia and sent by Rotary to Dili and transported to Fuat. Fortunately we had the use of a generator for electricity. The teams worked seamlessly with their Timorese counterparts. Within just nine days the cedar posts, the roofing beams, rafters and corrugated iron sheets; guttering and timber frames were all complete. My role as translator was often redundant as tools do seem to talk. However there were times when the right word couldn’t be found for some tools so when Darren asked for a spirit level, this was translated as a long piece of metal with water inside. Much laughter ensued! 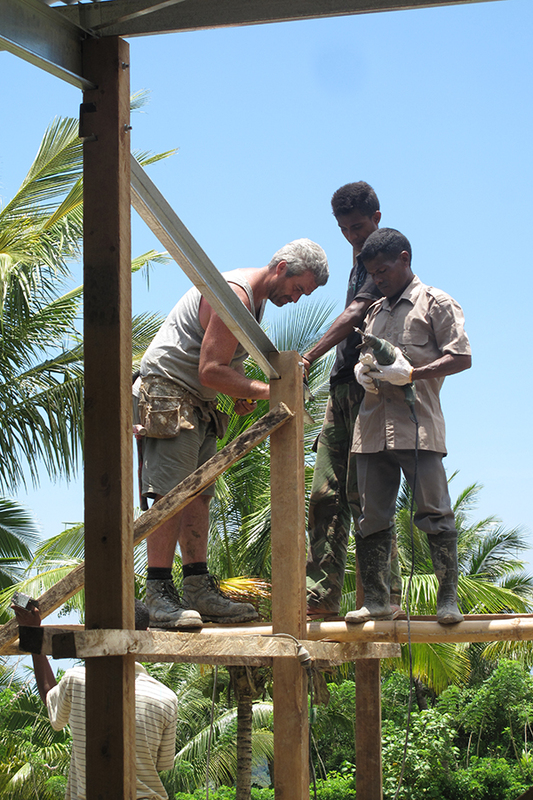 There was a lot learning for everyone, with Darren and Graeme gaining some knowledge of stone foundation work and bebak (slatted panels made from the base of the palm frond), while the Timorese learned how to work with steel. It was the first time the village men had used power tools and they were amazed at how fast things got done. Mario is the most skilled builder in the village and took the role of ‘foreman’. As the departure date of his Australian friends drew closer, he ensured his team worked closely with Graeme to ensure all the timber for the windows and doors frames was cut. This work is usually done by hand and takes days. On the final evening, we were treated to both an incredible sunset and a traditional feast, hosted by the Chief of the village. The builders took turns in expressing how they felt and what they learned. Watching the building team say goodbye the following morning was one very special and moving moment. Big Darren hugging tiny Mario; and Filipe expressing his appreciation as he walked home from his $3-day-work-for–the-government; seeing the tears in his eyes as he watched our car pull away. The community expresses their appreciation for our assistance in many ways, which makes all the challenges worth it. The team from the Alternative Technology Association (Australia) arrived to install the solar panels on the 25th Oct. Rowan and Peter did an amazing job particularly since the dimensions of the building had changed and they had to design the system on site and quickly. The installation took just two days to complete, with the assistance of the village men, and the system is state of the art, with high-intensity, task orientated LED weaving lights for the women and general lighting for community meetings. The ambience is lovely and the community was delighted when, upon completion late on the last night, the switches were flicked and the whole building lit up with light!